Our Innovation Program is delivering operational efficiencies, improved safety practices, enhanced customer and environmental outcomes and improvements to our workplace culture. Through our Research and Development Program, we identify areas for future investment, conduct pilot and trials and work with industry and research partners to explore new and innovative ways to operate to benefit customers and the wider community. Closely aligned to our strategic direction, our Innovation Program is empowering our employees, enhancing customer service and helping us achieve our purpose and vision. avoided an $8 million upgrade to the Beaudesert Sewage Treatment Plant. improving the long-term health of urban waterways. 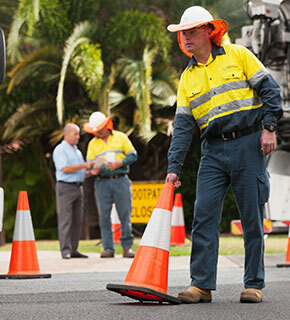 Woolloongabba Sewer Capacity Upgrade Project. Our Poo Car runs on electricity generated from sewage at our Oxley Creek Sewage Treatment Plant in Brisbane's west. We're converting the waste from 300,000 people into electricity, to run both this electric car and our sewage treatment plant. By harnessing the power of poo, we're not only reducing our operating costs but helping the environment by using a cleaner, greener energy source. The electricity used to charge the car - a Mitsubishi innovative Electric Vehicle (i-MiEV) - is produced by our cogeneration unit. Cogeneration involves capturing the biogas produced from sewage sludge, then using it to drive an engine which creates electricity. If you see us on the road, make sure to give us a wave! One of our most exciting long-term trials, and first of its type, involves impressive bacteria called Anammox. We have been growing Anammox with our research partners for the past five years, and now we’re taking steps with industry specialists to put the bugs to good use in the treatment of sewage. This friendly micro-organism is an energy-efficient nitrogen removal process that uses less oxygen and doesn’t require an extra food source, in contrast to the bacteria currently used in conventional sewage treatment processes. They look like a floating mattress but they are far from a resting place. These floating wetlands are a Queensland first, working 24/7 to purify sewage at the Forest Hill Sewage Treatment Plant near Laidley. The mattresses are part of an innovative trial to grow wetlands on specially engineered plastic mattresses, which are then floated on purpose-built lagoons. Queensland Urban Utilities’ Michelle Cull, said it was a natural, cost effective and energy efficient solution to purifying sewage. The roots of the plants dangle beneath the mattress drawing out unwanted nutrients such as carbon, nitrogen and phosphorus, cleansing the water by trapping sediment and removing toxins. It’s a great example of green engineering and also has the potential to reduce operational costs at the plant. If the trial is successful, it will be rolled out at similar regional sewage treatment plants. We are currently trialling an internationally-renowned leak detection software system called TaKaDu, which allows us to monitor the pressure in our network and detect leaks before they become bursts. This technology provides alerts, reports and real-time insights about our network, meaning we can catch issues early, avoiding costly repairs and the inconvenience a burst may cause our customers, such as a water outage. By harnessing the abundance of sunshine and space across the Scenic Rim and Lockyer Valley, we are using solar energy to power our sewage treatment plants to benefit our customers, local community and the environment. Five hundred and fifty solar panels have been installed generating 134 kilowatts of green electricity, cutting grid power use at the facilities by more than 20 per cent. This is equivalent to taking 61 cars off the road for an entire year. We are one of the first water utilities in Queensland to use solar power in this way, future-proofing sewage treatment with renewable energy. Currently, wastewater utilities spend up to 25 per cent of their energy budget to remove nutrients from wastewater, mainly nitrogen and phosphorus. In sewage, these nutrients come primarily from people’s urine, rather than faeces or greywater. The UGold electro-concentration system, developed in partnership between Queensland Urban Utilities and the University of Queensland’s Advanced Water Management Centre, is the world’s first technology specifically designed to remove and recover these nutrients right at the source – the loo. This innovation has the potential to significantly reduce the cost of wastewater treatment. The nutrient recovery system also generates a concentrated liquid fertiliser and a solid product (ammonium bicarbonate) that has multiple reuse options. We’ve installed a pilot plant at our Innovation Centre at Luggage Point to conduct tests on real urine. The process is self-powered by a battery-like system with the energy contained in the urine itself. This technology is entirely chemical free and only requires minimal electricity. The trial will provide us with invaluable data around upscaling the technology for more sustainable wastewater treatment in the future.